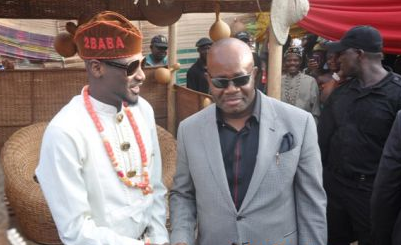 Investigations on Monday revealed a former Akwa Ibom State Governor as the chief sponsor of the planned massive nationwide protest being orchestrated by hip hop artiste, Innocent Idibia, popularly known as 2face against the President Muhammadu Buhari-led administration. The protest, planned to hold on Sunday, February 5, had in the last two weeks generated much hue and cry with some Nigerian celebrities queuing behind the move, while others had kicked against the intention. The Benue-born had taken to his Instagram page to confirm that the protest will hold as scheduled. He wrote: “A call for good governance. A call for urgent explanation into the reckless economic downturn nationwide. A call for nationwide protests as we say no to the Executive, no to legislatures, no to judiciary… You have all failed us. But on Monday, a source revealed that 2face was being used as a stooge to drive the protest aimed at smearing the Buhari-led Federal Government. It would be recalled that 2face and his wife, Annie Macaulay, in 2013, were gifted two brand new Prado SUVs by this former governor as their wedding gift which they graciously accepted.